Planning ahead for winter weather can help safe your retractable awning from damage. The weather can be particularly harsh on the east coast during the winter months. From the winter winds to the snow storms, the weather can severely damage your home’s exterior. So as you get your home ready for the winter weather, there are some things you should do to protect your home’s retractable residential awning. The key to keeping your awning from falling to winter weather is to inspect for worn spots and tears. Inspecting your fabric awning around the edges will allow you to see any threads that are beginning to unraveling. 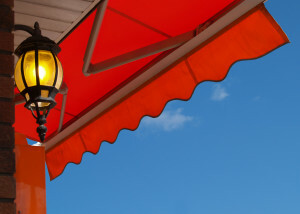 Another area of your awning that is prone to wear and unraveling is the valance. Valances are particularly prone to damage due to high winds. Inspecting your awning’s fabric and frame will help to keep existing damage from spreading to other areas of your awning. After inspecting your awning, there is no better time to fix your awning’s major and minor problems. Patching any tiny tears in your awning can help preventing small holes from turning into larger ones. After removing debris off of your awning, it is important to give your awning a thorough wash. Remove your fabric from the frame and gently washing it with a gentle cleanser can help keep your awning from developing stains, mold, and mildew. Simply spraying your awning down with a garden hose will not allow your awning to get thoroughly clean and spraying your awning with a power or pressure washer could cause damage. Let your awning air dry before hanging it back on its frame. One way to protect your home’s residential awning is to retract it. Retracting your awning will not allow snow or ice to damage the fabric and will neatly tuck it into the side of your home. Using a cover on your awning will also help keep winter weather from your awning and keep nesting bird off of your awning during the early spring months. If you are worried about your residential awning, ask your Carroll Awning representative about our winter storage services. The Carroll Awning team will come to your home in the fall months and take down your awning. It will be stored during the winter months before being reinstalled in the spring. This service will allow your awning to be easily maintained and protected during the winter months. Protecting and maintaining your retractable awning should be a priority when preparing your home for the winter months. For questions or to schedule the Winter Storage Services for your retractable awning, call Carroll Awning Company today!